Green spaces and traditional seaside gardens around Poole provide a pleasant contrast to the harbourside quay and the beachfront of Sandbanks. 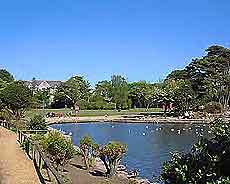 Poole Park is by far the most popular and comes with an excellent choice of attractions for all ages, including a boating lake with pedalos and kayaks, and a fun miniature golf course. Also in Poole are the historic gardens of Compton Acres, which were first landscaped in the 1920s by a wealthy local margarine baron and continue to draw thousands of visitors each year. Those heading to Bournemouth will likely encounter the Victorian-style Lower Pleasure Gardens on their way to the beach, where lawns and benches serve as impromptu picnic spots, under the shade of the mature pine trees and holm oaks. Poole Park first opened more than 100 years ago and features superb flower displays and a particularly scenic setting. This popular recreational spot has won a number of awards over the years, such as Southern England's Best Park Award. Attractions include the lakeside Cygnet Continental Café Bar, a jungle playground with a large ball pit and spiral slides, a miniature railway, a large boating lake - known as Swan Lake and featuring many different boats for hire, and radio controlled miniature boats. Poole Park also has an immaculate bowling green, crazy golf, a small pitch and putt golf course, and a group of tennis courts. Situated on the outskirts of Poole, privately-owned Compton Acres features seven magnificent themed gardens. As you first enter the grounds you will be greeted by the Italian Garden, which features elegant formal landscaping and a large centerpiece cross-shaped pond, complete with golden orfe fish, fountains and statues. 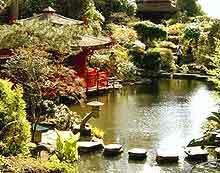 Nearby is the Palm Court, a Roman grotto, alpine and heather beds, and the very authentic-looking Japanese Garden, which boasts an ornate tea house, a huge pond crossed by stepping stones, numerous maples and bamboo, and various old stone lanterns. A plant centre is on hand, should you need to stock up on anything. Bournemouth's classic Pleasure Gardens are to be found within the heart of the town centre, next to the seafront and the Oceanarium. There really are many attractions located within the grounds, with the Lower Gardens being the most popular and boasting large pines, a bandstand, lots of seating, a group of aviaries, a market for local artists, and plenty of stalls selling ice creams. Recently revamped, the miniature golf course provides something for all of the family and stays open until late during the summer, to cope with the constant demand. Located roughly 5 miles / 8 km to the east of Poole, the famous Argyll Gardens at Alum Chine are filled with exotics, such as mature yuccas and pines, and stand high above the seafront. Originally laid out in the early part of the 20th century, the gardens come with a bowling green, terraces, a paved observation deck, Mediterranean-style planting and woodland pathways. Roughly a 15-minute drive from Poole, the Knyveton Gardens are located in the East Cliff area, being within walking distance of the Boscombe beachfront. Visitors will find colourful flower beds, a sensory garden with especially fragrant plants, a wildlife area with a small pond, a modern pavilion with toilets, and well-maintained bowling greens. 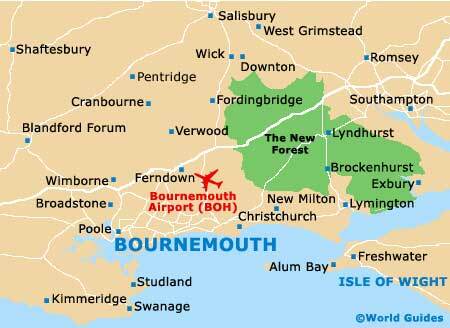 Dating back to the late 1920s, the Seafield Gardens reside within Southbourne, to the east of Bournemouth and Poole. These notable community gardens lie near the cliff top and beachfront, where they offer bowling greens, tennis courts and even a croquet lawn. Worth looking out for is the old Grade-II listed water tower.